I'd prefer a songwriter doing it through music. Don't worry Mutt fan. I'm sure there will be no dirt to embarrass Mutt. I thought he is first and foremost shanianuts! He seems to have crashed and burned on that front. If Shania does dish some dirt, oh well. Live with it. Just as Shania may reveal some stuff we as Shania fans may not like too much. I think this will add another piece to the puzzle of "Who is Shania Twain?" I also look forward to seeing if she goes into any other details Eggar may have missed, or interpreted. So we get Shania's side of the story. Shania is going to be Queen of all media in 2011..lol Look at how inspiring Shania has been to millions of fans, she is just continuing the tradition. The last few months we got plenty of information! especialy in comparison to before...LOL! I'm sure there will be no dirt to embarrass Mutt. I don't think there'll be any either. Shania Boards ID Cards here ! 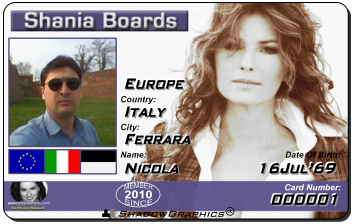 My Shania Boards ID Card! Haven't been here for a few days, been busy. Interesting development to say the least. Seems to me it wasn't that many years ago Shania said no one could ever get her story right because they would never know all the facts and that she would not do it because she wanted to keep her family's life private, or something like that. So now apparently she has had an epiphany of sorts and wanting to set the record straight about her life has now become #1. I'm glad she's doing so. When Robin Eggar's book came out we all had many questions as to it's accuracy in many areas as I'm sure all of her fans did. I look forward to her real story, i.e., if it is real. To be honest, I had a suspicion she might never do this. So, now that she says she will, then even if music does take a back seat for a while, so be it. The manuscript is finished and being edited by the publisher according to my reading of the news releases so I do not see why music needs to take a backseat unless she is finished putting out music. I really think there is music in the wings or she wouldn't have signed with a new management company. I think 2011 is the album with a tour in 2012. The book marks the end and the beginning of a chapter in her life. it certainly will mark the end of a period in Shania's life. But when one door is closed, another one is opening. Maybe new music is closer then we think, and maybe there will be some turns in the road before we get there. I am sure music it with her every day, but when it will transform to songs she wants to share with her fans, only she knows.